The holidays are just around the corner. While some people may be going solo as they pretend to be a cowboy from over 100 years ago, others may want something a bit more futuristic to play. Something they could also play with friends or family, in real life. Caged Element and Wired Productions have been hard at work these past four years to bring racing fans GRIP: Combat Racing, an arcade racer featuring reversible vehicles doing explosive combat, tricks, and doing it all at ridiculous speeds. Read our GRIP: Combat Racing review to see if this fast-paced racer brings the fun alongside the intense speed. Children of the ‘90s might remember the Tyco Rebound R/C car. This was a toy that could handle the roughest terrain, because if it ever flipped over on a particularly steep incline, the car was designed in such a way that it could keep going with little issue. GRIP’s cars have essentially this same feature, but brought to the player at a much faster speed. All vehicles are vertically symmetrical, so that if they flip, they can still drive. This also means that driving on the walls and ceilings of GRIP’s 22 maps is not only possible, but encouraged. Some objects in various levels take advantage of this fact, like a ramp that leads into a narrow pipe, which can be scaled without issue, launching the player in a high arc over the competition. Twisting, corkscrew-pattern bridges, paths that lead straight into walls, and other unique obstacles ensure that vehicles don’t stay stuck to the ground for long. If all this flipping, twisting and turning sounds like it might be hard to keep up with, we can thankfully report that this isn’t the case. GRIP’s camera stays directly behind the player during these transitions between surfaces or while flipping orientation, and does not become a nuisance despite all the on-screen chaos that can ensue. A couple of first-person views are available, and upon transitioning to a new orientation, the camera simply flips the view once the car’s new downforce direction has been determined. It’s perhaps slightly jarring, but is a manageable effect to learn to anticipate. The Unreal Engine is under the hood of GRIP. 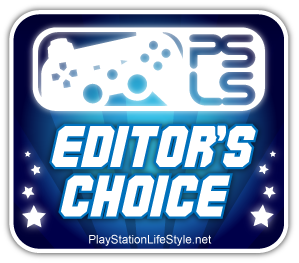 As usual, this engine offers great performance, especially on a PlayStation 4 Pro. HDR is supported, and even in 4K resolution, the game targets and appears to mostly hit 60 frames per second. Arcade racing just wouldn’t feel as intense at a lower frame rate. Cars have an impressive amount of detail, with crisp lines and plenty of effects such as heat radiating from engines, or sparks as they collide with the environment. 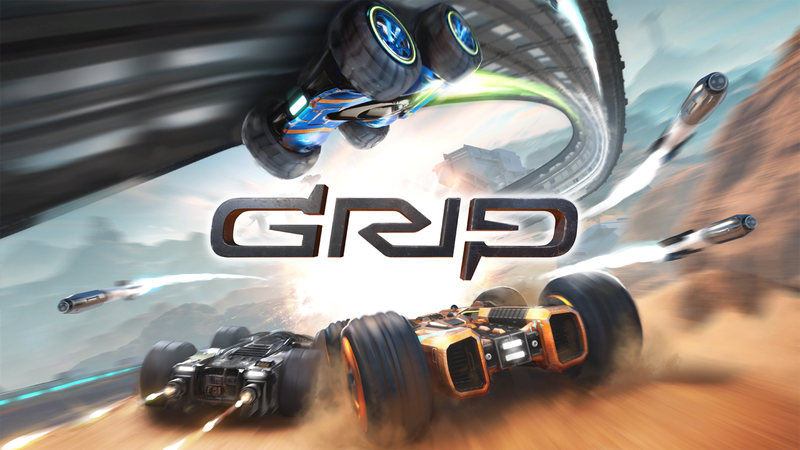 GRIP is a combat racer. Much like WipEout, the pickups on offer in GRIP are mostly grounded in reality, or at least sci-fi reality. There’s heat-seeking missiles, miniguns, boosts, and shields, along with other pickups that must be unlocked through the campaign. Each vehicle can hold two weapons, fired with L1 and R1. The weapon in the second slot can be sacrificed to power up the first, resulting in more damage, or better protection in the case of defensive pickups. This isn’t really explained in GRIP’s incredibly light tutorial, but is a feature that is indicated in the in-game guide. In other words, for players who don’t bother to read, they may not realize they have more combat options unless they stumble upon this information online, or figure out the charging mechanic on their own. In that regard, GRIP is much like the ‘90s games it draws inspiration from, with less hand holding. This may annoy younger gamers, but it also leaves a sense of discovery many games are lacking these days. Combat racing games are almost required to include battle arena, and GRIP includes a handful. These levels are designed with speed and gravity-defying tricks in mind. Ramps that flip players, glass-covered domes reminiscent of Rocket League, and multi-level areas all aim to keep players dodging one another and launching cross-map attacks to keep the action frenetic. Racing games of this nature often feature unlockables, and GRIP is no different in that regard. Each race will earn the player XP, which will inevitably result in gaining one or more levels. New decals, tires, and rims can be unlocked at certain levels, each of which can have their colors customized. New unlocks must be discovered from the garage menu. There is a small highlight for some categories when new items are unlocked, but to know that a new car has been unlocked requires combing through the menu, which can be cumbersome. Online multiplayer for up to ten players is offered in GRIP, as well as four-player split screen, a true rarity in today’s industry. Graphics do not noticeably dip down in fidelity, though since the environments are almost always blurring past the player perhaps the downturn in graphics is simply not easily noticed to begin with. More importantly, the frame rate remains consistently high. With the ability to make custom tournaments, the potential for GRIP to become a favorite group game is high. GRIP: Combat Racing is an impressive arcade racer, one that harkens back to the glory days of racers such as WipEout, while adding its own innovations. Jumping from floor to ceiling to wall and back sounds like it might be too hectic, but GRIP’s excellent camera handling ensures that players won’t lose track of what they are doing very easily. Four-player split screen, which is an absolute rarity these days, is a much-appreciated inclusion, and ensures that GRIP: Combat Racing will be played by groups for a while to come. GRIP: Combat Racing review code provided by publisher. Version 1.02 reviewed on a PS4 Pro. For more information on scoring please see our Review Policy.